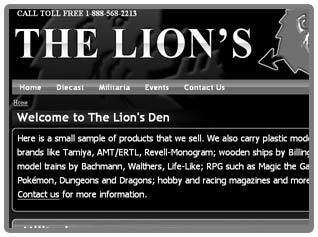 My father's hobby store. Built from scratch. 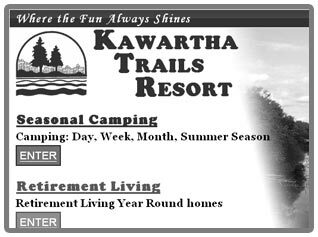 Kawartha Trails Resort, about 15 mins south of Peterborough, have been a great client to work with. This was a complete redesign. Content was taken from a previous site and one what was half built. A humble graphical design because the resort is in a dial-up area. My college project and still a client. 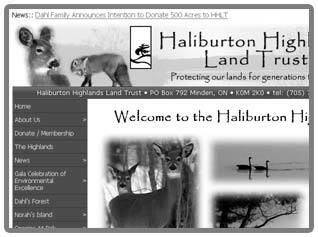 HHLT is a great organization perserving the wilderness in the Haliburton Highlands area. 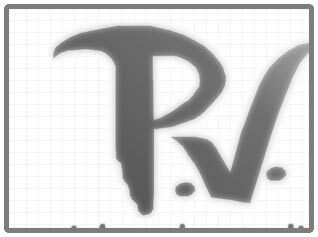 Another business in a dial-up or satelite ISP area so image file size optimization is a key. In this project, I was referred to the Athletic Director by a former teacher of mine to build a web site for the recreation department. Before, all that was there was some contact information which hadn't been updated since 1999. My goal was to design a site which utilized the branding of Fleming College and combine it with the aspects of sports. I incorporated the school's colours as much as possible into the header and navigation as sports teams are distinguished by colours. A linear layout was used as most playing surfaces are square, straight and outlined. The title, 'Frost Recreation', was designed to give it a bit of attitude, arrogance. The Sunshine Coast is located a ferry ride away west from Vancouver, B.C. My home town is Sechelt (pronounced see-shelt), which is the gateway to the Sechelt Peninsula. The Sunshine Coast is famous for The Beachcombers, a long-running CBC television program and The Sechelt Nation, Canada's first self-governing aboriginals.